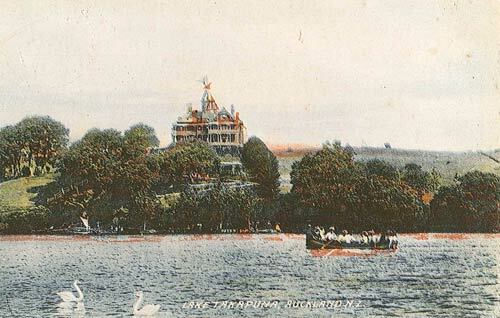 The Lake Hotel overlooking Lake Pupuke was built in 1887 by Edwin Harrow. Many locals opposed the issuing of a liquor licence for the hotel and several attempts were made to burn down the hotel. In 1909 a blaze destroyed the building – members of the Women’s Christian Temperance Union were blamed. The hotel was not rebuilt. This is a black-and-white photograph that has been coloured later.